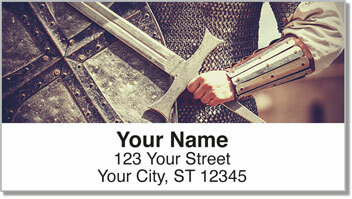 If they had address labels during the time of King Arthur, this is the design that would be used by all the Knights of the Roundtable. Imagery of gallant warriors preparing to joust, a coat of arms as well as ancient armor and weaponry make this an attractive selection that will give your mail a regal appearance. If you have the heart of a brave knight in shining armor, these are a perfect choice. 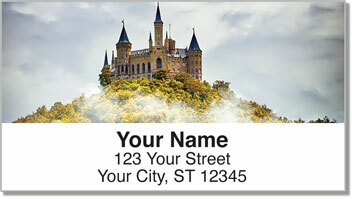 Not only are Medieval Address Labels from CheckAdvantage eye-catching, they will also save you a ton of time. 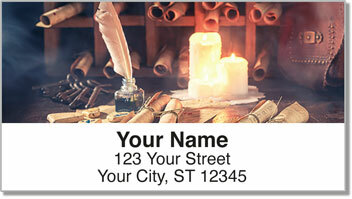 Stick them on all your letters and packages and avoid the annoying task of writing out your name and address by hand. 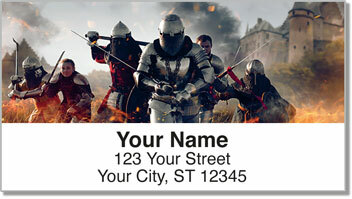 Get your own Medieval Address Labels today! Complete your order with matching personal checks.